Here we are just south of Cincinnati in Kentucky staying with friends; 3 weeks on the road & 4 to go. So far, so good! July started out with a brand new gig with a brand new baby grand piano, Caspy’s in St. Pete. Watch for our return there in the fall! Also played at Classic Wax in Sarasota with old friend/harmonica player Dan Electro, visiting from Spain! We hit the road on July 15, played Richmond, VA on the 17th and Fredericksburg, VA on the 18th. That was a really special night for us, as our friends Saffire: The Uppity Blues Women were all in attendance! The next day, we drove to Maryland for our son’s wedding! It was a beautiful weekend at the wedding & with family. Congratulations to Mary & Andrew! We then headed west to Ohio & Doc’s hometown of New Philadelphia, where we played the Atwood Yacht Club (think it’s our longest running gig!) & Danny’s. We also played a concert at Sound of Blue near Kent, our fave record store- all blues! Stayed a night at my mom’s near Beverly, OH where we jammed with my cousin Steve, then drove west to Cincinnati. On July 31, we performed at a Leukemia & Lymphoma Society Benefit held at the home of the Ambassador to Switzerland! It’s the largest home I’ve ever been inside, & I played on a 9 foot Steinway Grand Piano! Wow! The next night we went to the Queen City Blues Festival to hear Anson Funderburgh & the Rockets featuring Sam Myers. It’s the first time we’d heard the band- they’re incredible- & especially liked the piano/B-3 player, of course. He’s former St. Pete Cutaway John Street. Enjoyed chatting with him backstage & catching up on news. The next day, we checked into the Crowne Plaza right downtown and that night, we returned to the Fest to hear our fave acoustic guitarist & dear friend Roy Book Binder play an entertaining set. He parked his bus outside our friend’s house here in KY most of the week, so in between gigs we’ve enjoyed his company immensely. After his show, we attended a piano party with all the Festival piano players (another Steinway Grand- I’m getting spoiled!) Then on Saturday, August 3, we were honored to play the Festival for the 8th year on the Arches Boogie Woogie Piano Stage. 14 pianists, all day long- paradise! The only glitches were the heat & a brief storm. The pianists included Ann Rabson, Big Joe Duskin, Mr. B and Bob Seely, and the show concluded at 10p.m. with a grand finale (4 pianists at a time on 2 pianos)- you should have been there if you weren’t! Resting up now for the next 5 gigs this week starting tomorrow. Can’t wait to see you folks on the road & love & thanks as always to everyone for your support! I’m excited! Just last Thursday I bought a new piano! It’s a Yamaha (my 3rd Yamaha in a row- time for an endorsement?!) P80 stage (electric) piano, for all the gigs without acoustic (real) pianos. It has 88 weighted keys, yet weighs only 37 lbs! Plus I got a case for it with wheels- a marvelous invention! It sounds & feels like a real piano & will enable me to more easily switch back & forth from it to acoustic pianos, such as my baby grand at home which I practice on. (It’s much like the difference between a manual and electric typewriter). Hated to trade in my old Yamaha YPP55 with all it’s memories, played at countless gigs since 1994. But I’ve been longing for the full 88 keys instead of 76, and the heavier touch. When I began my career 25 years ago, there were real pianos at most every gig. Sad to say, they’re pretty rare these days. I finally broke down in the 1970’s & bought my first electric piano, a Fender Rhodes. But it was heavy and didn’t sound like a real piano. In recent years, the companies have come up with amazingly realistic piano sounds, but most of the 88-key models were large & heavy, so I waited. Finally, a relatively light 88-key piano!! That’s why I’m excited!! I’m also thankful for some great gigs this spring, and for all of you who have supported us by coming out & listening. Always a treat to see familiar faces, as well as new ones. The many dates at the 8th Avenue Fishhouse in Pass-a-Grille, with its funky Key West atmosphere, have been a lot of fun. The Sunday Blues Jam at O’Malley’s has been growing every since we began hosting it in March, thanks to all the fine players who have participated! HT Kane’s is still a favorite after more than 3 years there (2nd Friday of the month.) It was an honor to play 2 tributes to Rock Bottom in May: at Lowry Park in Tampa (televised live!) and at the 50th Florida Folk Festival in White Springs. Speaking of tributes, we must mention 2 friends we lost this year unexpectantly. Both of them were only 50 years old & are sorely missed. On February 2, Maureen DelGrosso, blues pianist, singer, writer, teacher, photographer died in Los Angeles. I met Maureen at Blues Week in West Virginia in the early 1990’s when I took her blues piano class & was so impressed by her talent, style and sense of humor. She also wore the coolest clothes and had the most beautiful handwriting. 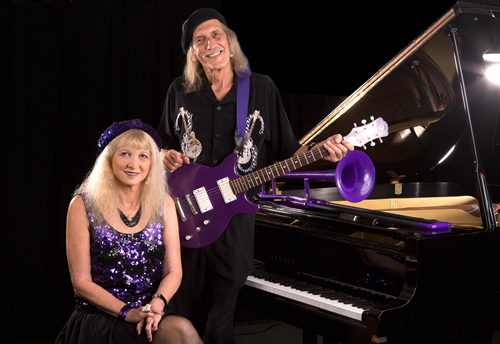 She & her husband Rich were a blues duo, which endeared them to us even more. In a 1997 Blues Revue magazine, we were thrilled to read a wonderful review of our “Six Fingers Boogie” CD- the best review we ever received! When we got to the bottom of the column, we learned that Maureen had written it. I hope she knew how much that meant to us & how much SHE meant to us. Our love, thoughts and prayers go out to Rich and her family. Tim Ashbaugh of New Philadelphia, OH (Doc’s hometown) died on April 15. Since the mid-1980’s, Tim had been a regular fan at most gigs we played in that area. He’d always request Bob Dylan, but he loved the blues and live music, period. Our music career has continued all these years because of folks like Tim, who encouraged us by his very presence, passion for the music and loyalty. He was a serious mountain climber, and one year, after he’d bought a Liz Pennock bandana we were selling, said he would be climbing the Himalayan mountains near Katmandu & would plant it, like a flag, at the highest point he reached. We thought he was kidding, until he sent us a photo on the mountain with the bandana!! As much as we love playing New Philly, it will be difficult this year to not see Tim walk in, flashing that shy grin. Thanks, Tim- love and miss you! I also recently lost the first of my first cousins, David Lewis of Ohio. Perhaps my first memory of live music outside of church was when he and his brother Roger played their accordians at Grandma Pennock’s house at Christmastime- we were all so impressed! Their brother Gary is in fact a great professional keyboard player in the New Philadelphia, OH area. We send our love and sympathy to him & hope to see & hear him play this summer. And that leads us to the Summer Tour, coming up in mid-July through early September. We’re in a tiz preparing for it, and beginning to look forward to seeing everyone! It begins in Virginia, a state I’ve never performed in. Then north to Maryland for our son Andrew’s wedding! After that, it’s east to Ohio (including the Queen City Blues Fest in Cincinnati! ), south to West Virginia, then Tennessee! See our DATES page for all the details. We’ll try to write a report from the road when we get time. We love you all- have a safe, happy summer! Enjoy live blues as often as you can! Happy Spring, everyone! With the sweet scent of orange blossoms from our two backyard trees wafting through our open windows and temps in the 70’s and 80’s, it’s beautiful here in St. Pete! We’ve had lots of northern visitors this month: Our two moms from Ohio, Doc’s sister-in-law and two nieces from Maryland, and Doc’s brother Charlie from Nebraska, and Liz’s sister Mary will be here from Ohio next week. We finally got to the beach last week! We have fifteen gigs booked in March, so it’s definitely been hectic. We’re also booking the Summer Tour and gearing up to begin recording our new CD which we hope to release in time for the tour. Since we last wrote, we’ve heard many fine concerts in the Tampa Bay area. For the first time, we saw two of our heroes, Little Richard & Chuck Berry, perform in October; it was Chuck Berry’s 75th Birthday Bash, and the show exceeded our expectations (Little Richard is now 69). In November, we heard our friends Saffire: The Uppity Blues Women in Tampa, where we danced to their rendition of Liz’s song “Take It Slow”. The next day, we visited with them over dinner. We also bought a copy of their new CD AIN’T GONNA HUSH- check out Saffire’s website from our LINKS page. One of our best buddies, Roy Book Binder, played an excellent concert in Gulfport in February, featuring many songs from his new “Singer-Songwriter Bluesman” CD- you can visit Roy’s website from our LINKS page. We’ll be meeting up with Roy on the road this year at two festivals- The Florida Folk Festival in May and the Queen City Blues Festival (Cincinnati) in August! Late in February, we heard Cincinnati guitarist Kelly Richey and, in March, caught Cleveland bluesman Mr. Downchild in St. Pete. It was great to see two Ohio friends touring down our way. On New Year’s Eve, we picked up our shiny, brand-new purple PT CRUISER, our first new car since 1984! The PT Cruiser should make us easier to spot on the tour, so if you see it parked outside a blues club, come on in! Tampa fans, watch for our TV commercial on Time/Warner Channel 15 (CTTV) for our concert at Lowry Park on May 24th. Thanks to everyone for your love and support! The blues world has lost one of its own greats, and we have lost one of our best friends- Rock Bottom passed away on Friday, September 28th at his home in St. Pete, Florida from an apparent heart attack. The 53-year-old blues harpist extraordinaire had just returned from a three-week European tour and played his last gig at Mojo’s in Palm Harbor the night before he died. Known as the “Godfather of the Tampa Bay blues scene,” Rock (aka David York) stunned the blues community with his passing, and hundreds of friends, fans, and family attended his memorial service in St. Pete. It’s very difficult to express how much Rock Bottom meant to us personally. He was our friend, confidante, and inspiration, and he was a major factor in our decision to relocate in Florida in 1996. Whether sharing the stage with him or sitting in the audience watching him do his magic, it was always a thrill to hear his booming voice, to listen to his rich, robust harmonica tones, and to enjoy his authentic blues, stage antics and frequently humorous songs. In many ways, Rock was the glue that held our regional blues scene together, and he was always an encouraging audience member at many of our gigs. Many of you have heard Rock on our “Walking Mary’s Blues” and “Six Fingers Boogie” albums. A memorial tribute show was held at Classic Wax in Sarasota on Sunday, October 14th, with many of the musicians who had worked with Rock over the years performing to a packed house. The Suncoast Blues Society has organized another Rock Bottom Memorial Benefit at Skipper’s Smokehouse in Tampa on October 28th, so if you’re in the area, come on out and show your support. Rock’s CDs will be available at this show, and they can also be purchased via his website (you can access his site on our LINKS page); we own and highly recommend all of his albums! All proceeds will go to Rock’s wife, Maureen. Hello from the road! Writing this from Les & Lilya Gruseck’s home in Kentucky, just south of Cincinnati, where we played the Redfish last Friday. (Les is the Blues photographer who shot our “Six Fingers Boogie” CD photos.) We have a couple of days off before we head south for the last leg of the six-week tour of 19 shows; we play Chattanooga this weekend and Atlanta on Monday, then head home to St. Pete where we’ll play Dave’s on August 31. It’s been a good tour so far. The van hit 90,000 miles & is running well, except that the dash A/C went out in Georgia the first week out. The midwest had heatwave after heatwave this summer. Last week’s cold front was refreshing, to say the least! We visited our son Andrew in North Carolina on the way north, then played the first gig at Sisters in Princeton, West Virginia, a cozy coffeehouse with super nice folks. It was a treat to play a few tunes with West Virginia Bluesman Nat Reese! The first Ohio date was at the Atwood Yacht Club near Canton, where they had a record crowd (thanks, Momma Blues, for bringing so many friends!!) We’ve played there since the mid-80’s & it was so good to see all the familiar faces! Another highlight was playing Danny’s in New Philadelphia, Doc’s hometown. The people there love music & Doc graduated high school with the club’s owner! My cousin Gary Lewis, keyboardist for the Barfly Band, stopped by. While in town, we enjoyed a game of miniature golf (it had been years!) & an Amish family golfed right behind us! The tour included many venues along the Ohio River, which appeared wider & more beautiful than we remembered: Marietta, Pomeroy, Cincinnati, Parkersburg & Huntington. In Parkersburg, we heard folk musicians & old friends Mike Morningstar & Rickie Roberts & shared a late-night breakfast with them, just like old times. We played the Court Street Grill in Pomeroy for the first time, & what a great place!! Joe & Beth Strassman really kept us going! The Diamond Teeth Mary Blues Fest in Huntington was fun, too & we heard some fine bands including Haywire Dog & Fat Daddy. While in Huntington, we visited the railroad tracks where we scattered Mary’s ashes exactly a year before. It struck us that there should be a plaque or marker in Mary’s honor at the site, so we’ll have to look into that. In between shows, we visited both of our moms in Ohio & saw all 4 of my siblings, plus other family members. My mom’s farm is quite the contrast from city blues clubs & was a relaxing respite. We played a few games of pool at her house & were tied in winnings when we left! The countryside is beautiful, but the roads seem to get curvier & steeper every year. Our friend Steve Williams wore his dancing shoes to the Thirsty Ear in Columbus & brought a large group of swing dancers who lit up the dance floor. It was great to see blues fans Jim & Kate Kirk as well as Terry Jump & Georgia at the Slippery Noodle in Indianapolis. Two books I read this summer were B.B. King’s & Little Richard’s autobiographies. What extraordinary lives they’ve led! We bought both books at the Sound of Blue near Kent, Ohio where we played a concert. It’s the best Blues store we’ve ever seen- stop by if you’re ever in the Kent area. As always, it was wonderful to see all our friends and fans again; some we hadn’t seen in years. That’s what makes the tour & all the miles worthwhile. Several folks asked about a new CD & we are working on it & hope to have it out before next summer. Thanks to all the venues on the tour and to each of you who came out to the shows and/or bought a CD, tape or ballcap! Keep supporting live blues in your area & we look forward to the next time we see you.